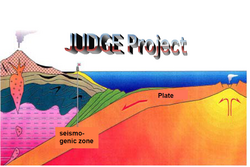 JUDGE Project (Japanese Ultra-deep Drilling and Geo-scientific Experiments) is a proposal for continental scientific drilling to intersect the subduction zone of the Philippine Sea Plate that underlies the Tokyo metropolitan area. The subduction zone is exceptionally shallow (depth=10 km) in the southern Boso Peninsula, about 30 km south of Tokyo and is accessible from a land-based drill site using conventional drilling technology. The JUDGE hole will penetrate the known source area of the great inter-plate earthquakes such as Genroku (1703; M=8.2) and Kanto earthquakes (1923; M=7.9) (Fig.1) which devastated Tokyo metropolitan area.